The Automobile Club de Monaco has unveiled a list of 89 crews which will enter the 84th edition of the Rallye Monte-Carlo in January 2016. Rallye Monte-Carlo is the first event of the 2016 World Rally Championship and is also counted for the WRC-2 and WRC-3 supporting categories. The car #1 on the starting podium in front of the famous Casino on January 21st will be Sebastien Ogier‘s Volkswagen Polo R WRC. The Triple world champion will be joined by Jari-Matti Latvala in #2 Polo and Andreas Mikkelsen in #9 Polo. 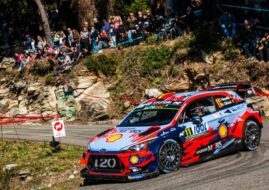 Hyundai will have cars with number 3 and 4 during the 2016 season, with Thiery Neuville and Dani Sordo nominated for manufacturers’ points, while Hayden Paddon will drive the #20 i20 WRC for Hyundai’s second team. There will be a completely new line-up of drivers in the M-Sport Ford Fiestas – Mads Ostberg in the #5 car and Eric Camilli in the #6 car. Abu Dhabi Total WRT drivers Kris Meeke and Stephane Lefebvre will drive DS3 WRC cars with numbers 7 and 8. Four more Fiesta RS WRC cars will be driven by Ott Tanak, Robert Kubica, Bryan Bouffier and Lorenzo Bertelli. The last on the list of 15 drivers with WRC machines is Italian Felice Re with Citroen DS3 WRC. Notable entries nominated for WRC-2 championship are Teemu Suninen, Armin Kremer, Julien Maurin and Esapekka Lappi with Škoda Fabia R5 cars, Quentin Gilbert and Jourdan Serderidis in Citroen DS3 R5 cars, while Elfyn Evans and Simone Tempestini will drive Ford Fiesta R5. Rally legend Francois Delecour will compete with Peugeot 207 S2000.